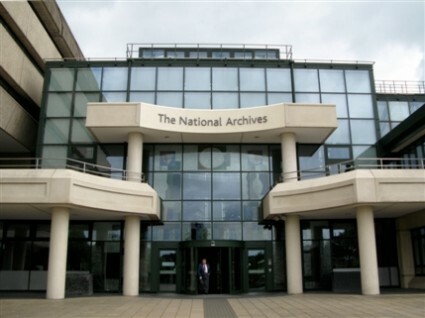 The National Archives is the UK government’s official archive – not to be confused with the National Archives and Records Administration in the USA. In 2003 the UK’s Public Record Office merged with the Historic Manuscripts Commission to become The National Archives (known to its friends as TNA), which pointed to a broader, more inclusive remit, but some still hanker for the reassuring days of the PRO. The location has remained the same – an imposing modernist building in Kew, to the west of London, with ponds and swans in its grounds, and hordes of historians and amateur genealogists within. It holds government and public records from the Domesday Book onwards, which are released to the public generally after thirty years have elapsed from their original production. All of which is preamble to the news that TNA has produced a podcast entitled The National Archives Goes to the Movies, and it’s rather good. Written and presented by Joseph Pugh, the podcast is a knowledgeable guide to the history of British cinema through the records of The National Archives. Recorded before an audience, around half of the hour-long talk is about the silent period. Among the subjects he covers are Will Barker’s 1911 film of Shakespeare’s Henry VIII, all copies of which were burned in a publicity stunt; the efforts of the Colonial Office to ban The Birth of a Nation; concern within the Home Office at how Cecil B. 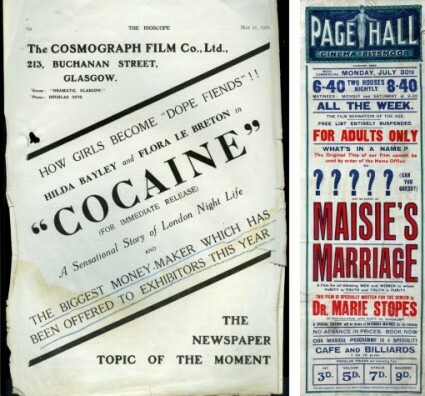 De Mille’s The Cheat could offend the Japanese; the production of Maurice Elvey’s ill-fated epic The Life Story of David Lloyd George (1918); the British government-sponsored dramas Hearts of the World (1918) and The Invasion of Britain (1918); Home Office efforts to ban Graham Cutts’ sensationalist Cocaine (1922); and Marie Stopes’ correspondence with the Home Office over her birth control film Married Love (aka Maisie’s Marriage) (1923). The point of the talk is not only to entertain but to encourage research. Consequently most of the films that Pugh refers to are also listed on Your Archives, TNA’s wiki where researchers can post information on files that they have found. I’m not sure how much the wiki gets used, because researchers tend to be a little wary of giving away all their sources, but the principle is noble. The sort of records one find in The National Archives are those which document the day-to-day processes of government departments. There are memos, memos responding to memos, and memos responding to memos responding to memos. There are letters, minutes, briefing papers, personal papers, official papers, diaries, reports, lists, registers, passenger lists, medal rolls, photographs, maps and posters. The contents are generally arranged chronologically, identified by government department and then gathered together by theme into individual numbered folders. The National Archives can be a daunting place for any newbie researcher. There is no single index, and although they produce an amazing rich online catalogue (helpfully named the Catalogue) they also have to produce a multitude of specialist guides that explain how to pursue particular topics. One of these research guides covers The Arts, Broadcasting and Film, and it’s a very good starting point. As said, The National Archives arranges its records by department, so it is important to know that responsibility for film was held by the Board of Trade’s Industries and Manufactures Department (formed 1918), but information on film is spread widely across particularly all departments. To produce a complete guide to TNA records to silent film would require a blog (or a wiki) all of its own, but here’s an outline guide to some of the key departments to explore. Please note that catalogue references will simply take you to the barest of descriptions online, and to view the documents themselves you will have to visit Kew. Records of aerial photography and cinematography during World War One are held in AIR 2 (search under ‘cinematography’). Records of registered companies (since dissolved), including hundreds of film businesses (producers, distributors, cinemas etc), with information on capital and shareholders, are in BT 31; records of liquidated companies 1890-1932 are in BT 34; trade marks (BT 42-53) includes film company trademarks, though there is no overall index so you need to search on-site by date (see the TNA guide on registered designs and trade marks); BT 226 has bankruptcy records for companies and individuals. BT 26 and BT 27 contains lists of ship passengers who arrived in (1878-1960) or left (1890-1960) the UK. The incoming lists themselves can be viewed online (payment required) at Ancestry, and the outgoing list (again payment required) at Ancestors on Board. Papers from the very heart of government. Nicholas Reeves’ Official British Film Propaganda During the First World War has a handy guide to PRO/TNA papers relating to official film, including Cabinet papers in CAB 21, 23-25, 27, 37 and 41. Many records relating to the production, distribution and exhibition of films in British colonies and countries of the empire, including records of the Empire Marketing Board (for which John Grierson worked) in CO 758 (correspondence), CO 759 (index cards), CO 760 (minutes, papers) and CO 956 (posters). Before the 1911 Copyright Act if a UK film producer wanted to copyright a film (usually they did so only if there had been a case of their work being copied) then they had to do so as it if was a photograph; consequently there are numerous records of films 1897-1912 registered under COPY 1. The registration forms were accompanied by single frames, bromide prints, or in a few cases a few frames of film (the originals are now held by the BFI). For a guide to this collection, which comprises a few hundred titles among the many thousands of photographs, see Richard Brown’s essay in Simon Popple and Colin Harding’s In the Kingdom of Shadows. There are also registers and indexes under COPY 3. Some film posters and other promotional material can also be found in the COPY records. Disparate documents on film and education, a theme of growing interest throughout the 1920s, including assorted commissions of enquiry. The Foreign Office was concerned with promoting British foreign policy. There are extensive records relating to British propaganda films being shown overseas during World War One, in particular FO 115 on propaganda in the USA and Canada, FO 371 covering general correspondence, and FO 395 which covers war films and American propaganda 1916-17. There is a card index to the FO papers in TNA’s search rooms, making this a particularly fruitful area to explore. The Home Office oversaw domestic policy. There are extensive records on actual legislation (starting with the 1909 Cinematograph Act) and proposed regulation affecting the British film business, including such issues as censorship, local authority control, unlicensed film exhibitions and the filming of contentious events (political marches etc) are in HO 45. See also HO 158 for relevant general papers and correspondence. Covers records of court cases (Chancery), often a rich source of information on how a film company operated. See in particular the winding up orders under J 13. Includes documents on film industry employees and industrial relations (though relatively little here for the silent era). The Metropolitan Police conducted surveys of early London cinemas around 1908-09 after they were causing some social concern. The result is a rich record of the early cinema business and audiences, to be found in MEPO 2. They are described in detail in Jon Burrows’ two essays ‘Penny Pleasures: Film exhibition in London during the Nickelodeon era, 1906-1914,’ Film History vol. 16 no. 1 (2004) and ‘Penny Pleasures II: Indecency, anarchy and junk film in London’s “Nickelodeons”, 1906-1914,’ Film History vol. 16 no. 2 (2004), while the London Project database lists the venues covered by files MEPO 2/9172 file 590446/7 and MEPO 2/9172, file 590446 (see also HO 45/10376/16142). There are later surveys of cinemas and screenings of indecent films in the 1920s. Has census returns from 1861 onwards (1841-1851 are under HO 107). These can all be found online through various commercial services (see details here), but all are available for free at Kew – see the helpful TNA guide to researching census records. There is relatively little that specifically relates to film here, as most papers relating to the War Office Cinematographic Committee will be found at the Imperial War Museum and the House of Lords Record Office (Beaverbrook Papers). But surviving records of film personnel who served during the War (including Official cameramen) can be found at WO 338 (officers’ service records), WO 363 (service records), WO 364 (pension records) and WO 372 (medal cards). Digitised copies of the actual documents in all four categories can be found online through TNA’s Documents Online or Ancestry (in both cases payment is required for downloads). Other records where information on silent era films can be found include ADM (Admiralty), CUST (Customs and Excise), IR (Inland Revenue), and T (Treasury). This is a very simplistic overview, and it must be stressed that information on films will be found all over the place. For example, type in the term ‘cinematograph’ in the catalogue and you will get 1,108 records from forty-four separate departments (448 records from twenty-five departments if you narrow the date search to 1896-1930). It is a good idea to look at the bibliographies of books and the end notes of journal articles which have benefited from research at TNA (or PRO before it) to pick up specific references and useful indications of where it would be profitable to search. The National Archives has produced some substantial publications which explore a subject in depth with copious file references. However, there is no such guide for film (one has been talked about for years but has never been forthcoming). However, there is a classic article by Nicholas Pronay, ‘The “Moving Picture” and Historical Research’, Journal of Contemporary History vol. 18 (1983) (available to higher education users on JSTOR) which describes in details the several kinds of government records which can be used for the study of film, describing why they were created, and giving specific file names. Note also that the above file information relates only to silent films – there is a huge amount of information at The National Archives relating to film (and television) from later periods, particularly govering the GPO Film Unit, film during World War II, the COI Film Unit, the Colonial Film Unit, broadcasting policy, British Council records, and much more besides. The National Archives is still an underused resource for film history, though we have got beyond the days when Rachael Low could write a multi-volume history of British film apparently without any reference to the Public Record Office. If you’ve not been, and you can get there, then you really should – it’s the most engrossing and rewarding research experience imaginable. Go explore. By the way, films can be public records too, but the productions of the Ministry of Information, the COI Film Unit and others are preserved on TNA’s behalf by the BFI National Archive and the Imperial War Museum. My thanks to Brad Scott for alerting me to the podcast.